Even if you haven’t been keeping up with the news, you’re probably aware of the spike in bad publicity from several airlines recently. With United Airlines’ April 9th incident (when a passenger was forcibly removed from an overbooked flight) questions were raised: Is United’s bad publicity a representation of other major airlines, or is United the outlier? What is the social chatter from other airlines? I know, I know, you’re probably thinking, “great, another blog about United. We get it – they wrongly handled the situation.” This blog won’t focus on how they could have better responded or how much of a PR issue they’re still facing. Instead, through the Sysomos tool that we at Delucchi use to scan millions of social content for our clients, I’ve collected data on conversations about the airline industry, analyzed and investigated if a crime in public opinion was committed by major US airlines. This is: The People v. the United Airlines. 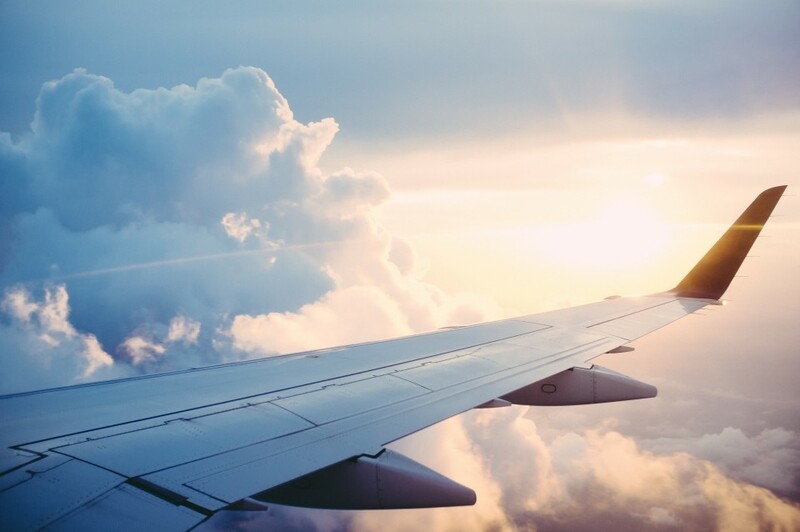 When discussing air travel or the airline industry, the predominate themes that emerged over the past year (May 2016 to April 2017) related to incidents involving a passenger or technical difficulties that impacted flights. Unsurprisingly, United Airlines’ April 9th incident drew the most attention in the online social world. To put it into perspective, the figure below shows the top 4 trending topics in the airline industry over the past year. 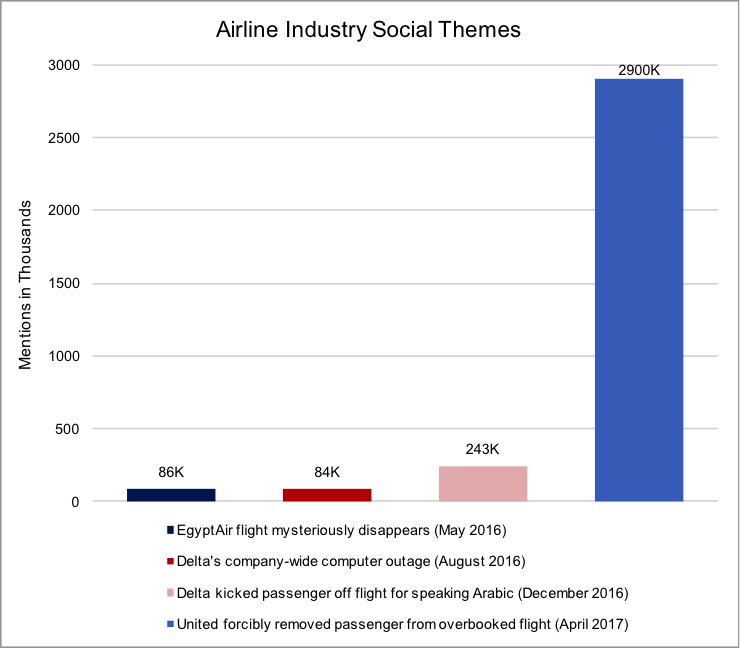 There were more than 2.9 million social mentions about United after the incident – that’s almost 12 times more chatter than the next most talked-about topic for the airline industry. Practically overnight, United’s online sentiments fell drastically, from an estimated 68% favorable conversations before the incident, down to 22% immediately after. 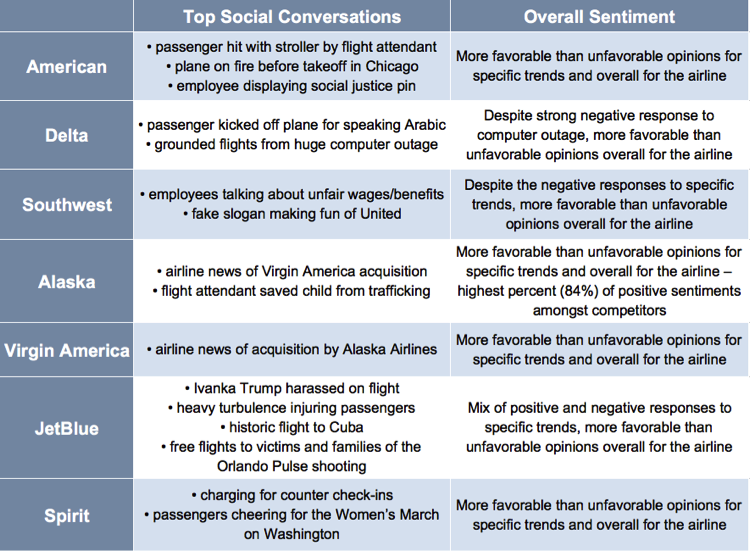 Looking at United’s sentiments over the year, unfavorable opinions have increased overall, with a steeper incline in recent months. This data suggests a connection between United’s incident and their short-term decline in overall sentiment. How does United fare in comparison to other major US airlines? Are similar themes and negative sentiments found with other airlines? The table below summarizes the social landscape over the past year. Similarly to United, the underlying themes across airlines centered around news involving passengers, staff, flights/planes, or the airline itself. The main point is that overall, each airline as regarded with positive sentiments, even for the airlines (Delta and Southwest) with trended negative responses. While it appears United’s incident had an impact on their overall public opinion, the airline is not representative of the airline industry. The social evidence does not hold the airline industry responsible for the negative opinions of United. Despite the negativity from United and the negative incidents a few airlines have faced, United Airlines are still well regarded overall. The lesson here is that the opinion of one brand does not necessarily leak into the competition and poison the industry. Note: Due to API limitations on Facebook and Instagram, Sysomos does not have full access to content on those platforms, meaning there are more mentions on Facebook and Instagram than what the data shows.